7th Regiment introduced the members of its 2018 design staff. The Academy announced the locations of multiple open houses and audition camps. When it comes to auditions, the Blue Devils say that every dream come true starts with a first step. Auditions for the Blue Devils B Winter Guard will be held in Concord, California on October 8. The Blue Devils C Winter Guard will hold an open house with a parent information meeting on October 5 in Concord, California. Blue Stars is asking drum corps fans to contribute to a GoFundMe campaign for a corps member who was suffered a serious head injury during a recent life-threatening accident. Bluecoats has a wide variety of Yamaha brass, percussion, and amplification equipment available for sale. Boston Crusaders will hold audition camps this year in Boston, Indianapolis, San Antonio, Dallas, and Tampa. The Cadets have plans next summer to make the corps' first tour to California since 2011. The Cavaliers announced audition camps for November 18-19 in Denton, Texas and December 8-10 in Rosemont, Illinois. Colts ask prospective 2018 members to fill out this interest form. Columbians is looking to add a large number of volunteers in a wide variety of positions to its organization. Crossmen encourages all to “Help bring back the arts” to school fine arts programs affected by the devastation of Hurricane Harvey. Genesis announced Texas audition camps in Lubbock, Houston, and Austin. In his fourth season with the corps, Matt Edwards has been promoted to brass caption head of the Guardians. Impulse will have a recruiting booth September 30 at the marching band competition at Gahr High School in Cerritos, California. September 30 is the last day to save $25 on registration for Legends' November 17-19 and December 15-17 auditions. Madison Scouts announced that Sean Phelan and Mark Trulson will serve as brass co-caption heads of the 2018 corps. Phelan is a former Scouts drum major and Jim Jones Leadership award winner. Mandarins will be holding audition camps in California on December 1-3 in Sacramento and December 15-17 in Arcadia. Pacific Crest announced that Ezekiel Lanser (battery percussion arranger) and Glen Crosby (program consultant) have joined the corps' design team. Brad Toth has been named brass caption head of Phantom Regiment. Toth previously served in the same position with the Blue Knights. Pioneer audition materials are now available for download to prospective members. 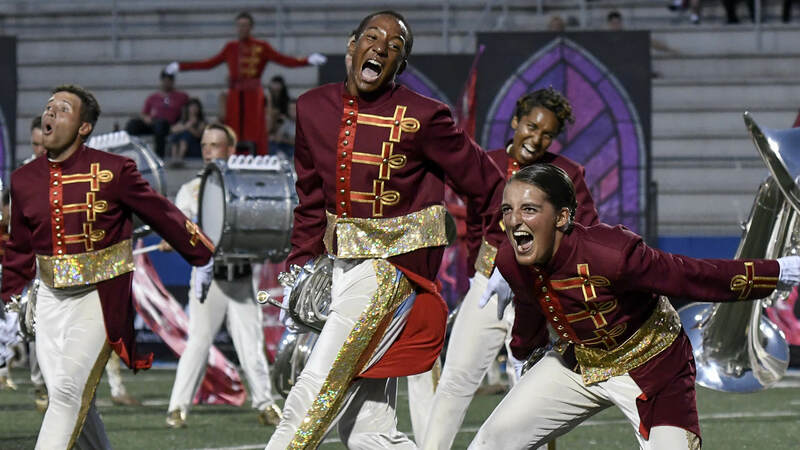 Santa Clara Vanguard introduced the members of the corps' 2018 design staff. New additions include Michael Gaines as creative director and drill designer and Michael Rosales as lead choreographer. All are invited to join the Seattle Cascades for Family Day at the Boeing Seattle Delivery Center on Sunday, October 1. The Shadow Indoor Percussion experience clinic will be held Saturday, September 30 at Oregon (Wisconsin) High School. Middle school and high school students are invited to attend this free event. Spartans will host experience and audition camps on November 18-19 and December 16-15 in Nashua, New Hampshire, with an additional open practice session scheduled for December 3. Brass audition materials are now available for those interested in marching with Spirit of Atlanta in 2018. Troopers is looking for a filmmaker/video producer for its 2018 summer season, between the end of May to mid-August.